Rabbi Levi Matusof says despite calls to stop wearing kippot in public, more and more French Jews are looking for sense of connection. Rabbi Levi Matusof, the Chabad emissary in Paris, dismissed a call by the leader of Marseille's Jewish community for Jews in the city to stop wearing kippot (skullcaps) to avoid being targeted by anti-Semites. "We heard the Rabbi of Paris call on (sports) fans to wear kippot during games and the Rabbi of Strasbourg will distribute kippot," Matusof said. "We feel the kippah protects us, it reminds us who is above us - God, who protects the people of Israel." "We will not give up one single detail from our Jewish life, not in France and not in Brussels," he continued. "I spoke with several French politicians and they all support us and say we must not give up the kippah." According to Matusof, most Jews in France are proud of their heritage. "I have no problem going out with tzitzit (ritual fringes) and a hat. Today, more and more Jews want to put on teffilin and wear a kippah." "Jewish identity is becoming stronger," he added. "More and more people in France are seeing lots of Jews walking around with a kippah on in the streets." "We need to see to it that Jews are able to live in Europe and everywhere else as Jews," Matusof insisted. "Those who want to immigrate to Israel from a sense of belonging should do it gladly, but not out of a sense of fear." At the same time, Matusof asserted, Jews definitely have a place in France. 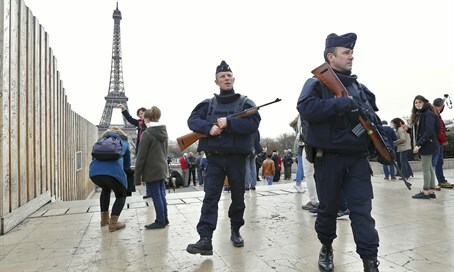 "We see more and more people coming to synagogue on Shabbat and holidays in France. At this time people especially want to feel more connected to a community."